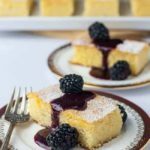 Light and lemony, this Italian-inspired Flourless Lemon Almond Ricotta Cake is ideal for brunch and is always welcome after a big meal! 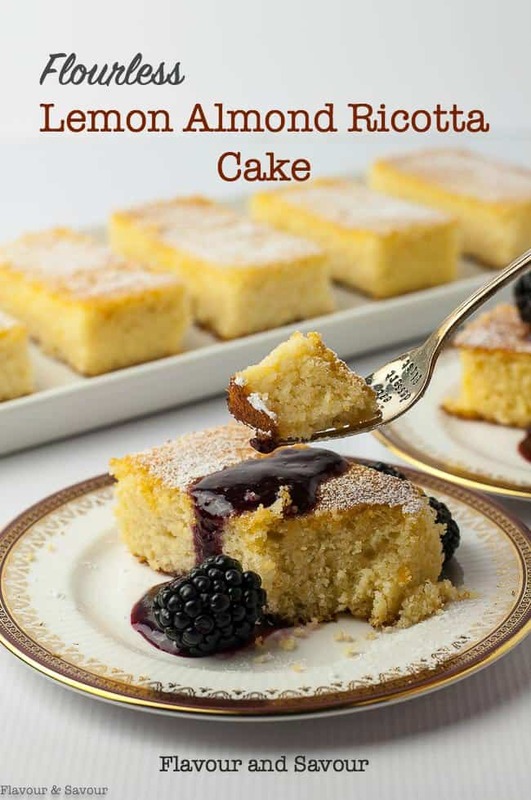 I don’t bake cakes very often, but if I did, this gluten-free Lemon Almond Ricotta Cake is the one I’d make every time. It’s light, delicately flavoured with fresh lemon and topped with a slightly sweetened silky blackberry sauce. Best of all, it never fails me! It’s a reliable recipe that always turns out. Ricotta cheese makes it moist and rich without feeling heavy. It slices beautifully without crumbling. It’s light, lemony and just sweet enough. This cake lends itself to a variety of toppings. A coulis is a thin sauce or purée made from vegetables or fruit. Whatever you want to call it, a fruit coulis is easy to prepare and makes a tasty addition to a dessert. Most fruits, and especially berries, will thicken beautifully on their own, but some may need a little cornstarch added. 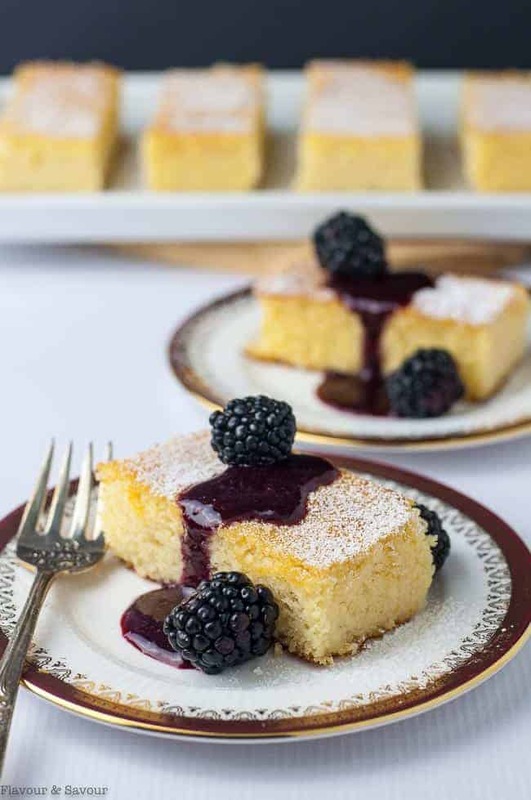 To make this blackberry coulis, combine 2 cups of berries with 1/4 cup sugar (or more if you like it sweeter), 1/4 cup water, and 2 tablespoons of lemon juice. Bring to a boil, then simmer until slightly thickened. Purée in a blender, food processor or with an immersion blender, then press through a fine sieve to remove seeds. This sauce will last up to a week in the refrigerator. Line your pan with parchment paper when baking gluten-free cakes. It makes it easy to remove the cake from the pan without having it break. Peel off the parchment paper as soon as you remove the cake from the pan. Whisk the almond flour and coconut flour before measuring. Make sure to remove any lumps. You can make the berry coulis well in advance. 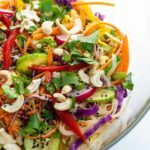 Store in the fridge for up to a week. If using blackberries or raspberries, be sure to press the sauce through a sieve to remove the seeds. Leave it perfectly plain. It’s delicious. Dust it lightly with powdered sugar. 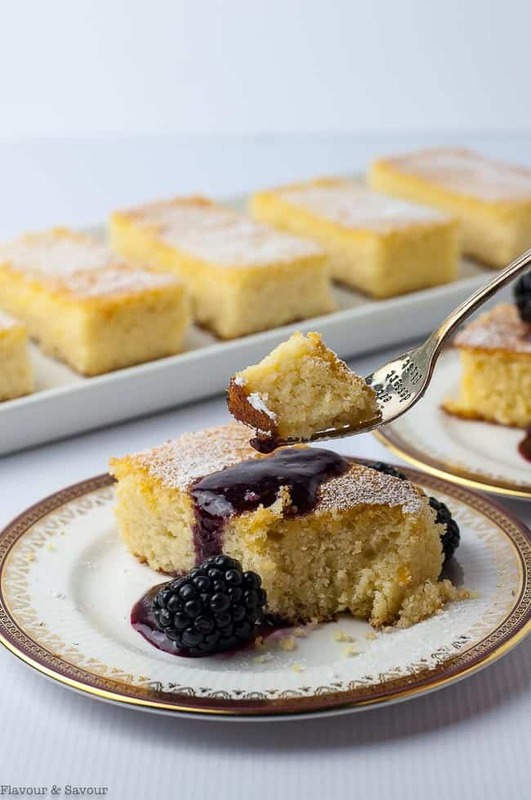 Drizzle with a berry coulis (or sauce) using blackberries, blueberries, or raspberries. Top plain cake with fresh berries and whipped cream. Add a spoonful or two of rhubarb compote. 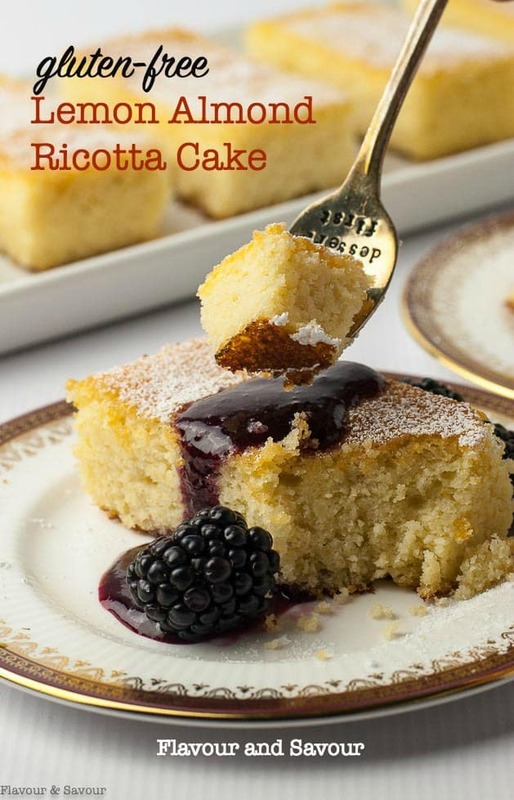 Ready to try another ricotta cake? You may like this Flourless Cherry Almond Ricotta Cake too. 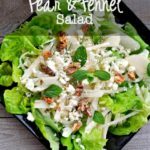 It’s tender and moist, has a delicate almond flavour and it’s finished off with flaked almonds and a creamy almond glaze. And if you love lemon desserts, you might like these, too. 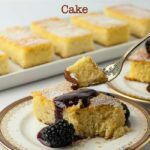 A gluten-free light lemon cake made with ricotta cheese and almond flour, this flourless Lemon Almond Ricotta Cake is delicious on its own or served with an easy-to-make berry sauce and fresh berries. Preheat oven to 325°F. Line an 8-inch square pan with parchment paper, or cut a circle to fit in the bottom of an 8-inch round pan. Measure the almond flour, coconut flour, baking powder and salt into a small bowl. Whisk to combine and remove any lumps or use a sifter. In a large bowl or the bowl of a stand mixer, cream the butter, sugar and vanilla until well combined. Add one egg and beat. Add the ricotta, lemon juice and zest and beat. Add 1/3 of the dry ingredients alternatively with an egg, repeating and finishing with the last egg. Spread into the lined pan, smoothing the top. Bake for 48 - 50 minutes or until cake tester comes out clean. Remove from the oven and let cool for 20 minutes. Loosen the edges with a knife, lay a cake rack over the pan, invert and remove the parchment paper. Invert back on to the first rack and let stand to cool completely. Trim edges with a sharp knife, if desired, then slice into 8 pieces. 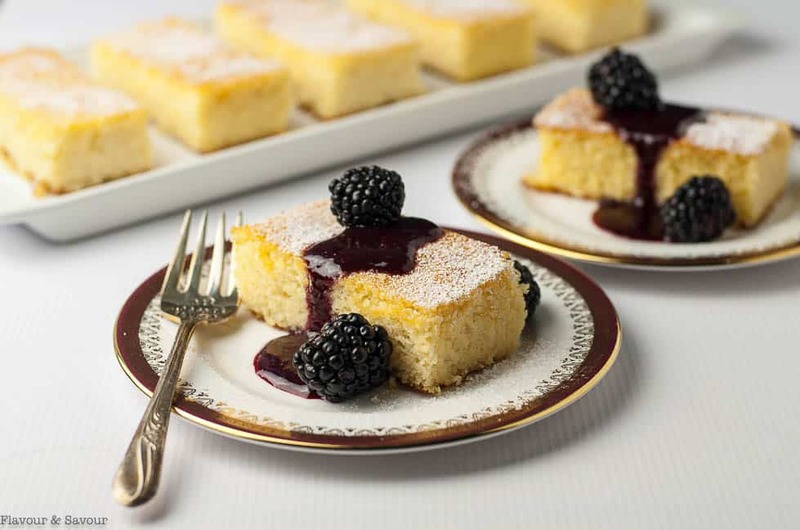 Serve with blackberry coulis and fresh berries. Store leftover cake in an airtight container. 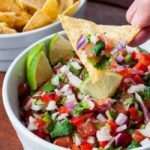 Combine all ingredients in a medium pot. Heat over medium heat until sugar dissolves. Bring to a boil, then simmer for 8 - 10 minutes or until slightly thickened. 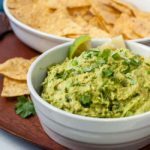 Transfer to a small food processor or blender and pulse until smooth. Press through a fine sieve to remove seeds. Allow to cool. Refrigerate leftover sauce. This cake turned out perfectly. We had it with raspberry sauce and whipped cream and it was delicious! That sounds perfect for summer! Thanks for commenting.